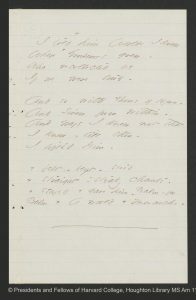 Link to EDA manuscript. Originally in: Poems: Packet XXXIV, Fascicle 21, written in ink, ca. 1862. 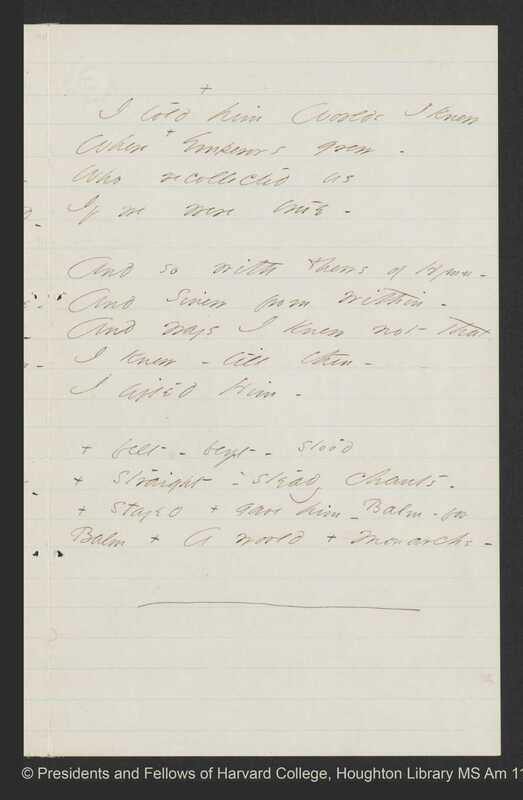 First published in Atlantic Monthly, 143 (March 1929), 327, and Further Poems (1929), 93, with stanzas 2 and 3 omitted and stanza division not retained. Courtesy of Houghton Library, Harvard University, Cambridge, Mass. This poem addresses power imbalances across a number of relationships. 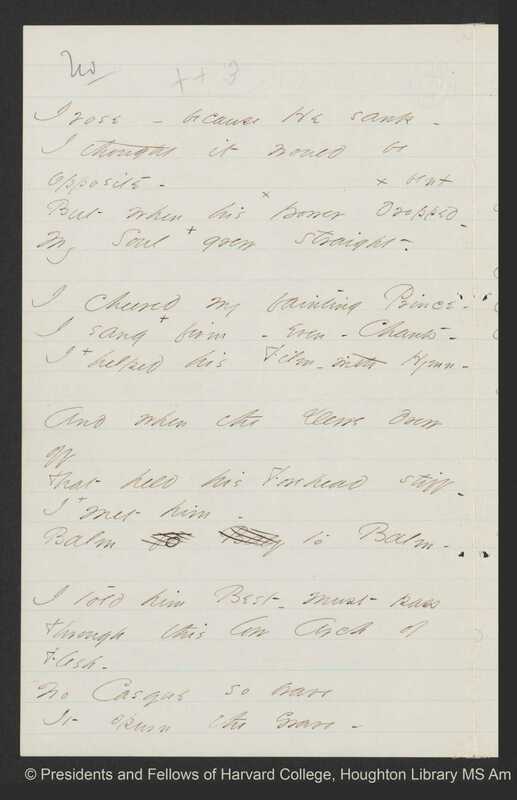 Several critics, including feminist critics, offer Charlotte Brontë’s novel, Jane Eyre as a background (see the discussion of this in “On Choosing the Poems” for this week). 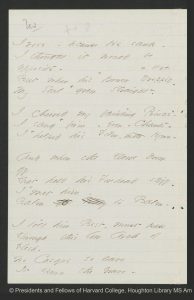 Wendy Martin, for example, asserts: “In addition to being a direct response to the novel, this poem describing Jane’s increasing strength and control is a paradigm for Emily Dickinson’s emotional growth in general.” Other readers see the poem as describing Dickinson’s increasing poetic confidence and the development of her relationship to her Muse. Still others read this poem in a religious light. Cynthia Wolff argues that as long as “God’s legend on earth remained strong, Dickinson could forge a poetic Voice of immense power by juxtaposing it against the force of the Divinity.” But the “fading of God’s presence,” which Wolff argues could already be felt in Amherst in 1862 and was further exacerbated by the devastation of the Civil War, “is a unique impediment to the poet’s efforts to assert eye/I. Thus one response to God’s decline is a remarkable effort to revive Him,” embodied in this poem. Another Biblical echo resonates in the word “Sinew,” which evokes the place of Jacob’s injury when he wrestled with the Angel.